by Jehle, Geoffrey Alexander, Reny, Philip J.
Jehle, Geoffrey Alexander, Reny, Philip J.
I. ECONOMIC AGENTS. 1. Consumer Theory. 2. Topics in Consumer Theory. 3. Theory of the Firm. II. MARKETS AND WELFARE. 4. Partial Equilibrium. 5. General Equilibrium. 6. Social Choice and Welfare. III. STRATEGIC BEHAVIOR. 7. Game Theory. 8. Information Economics. 9. Auctions and Mechanism Design. Math Appendix. Appendix: Sets and Mappings. Appendix: Calculus and Optimization. List of Theorems. List of Definitions. Hints and Answers. References. 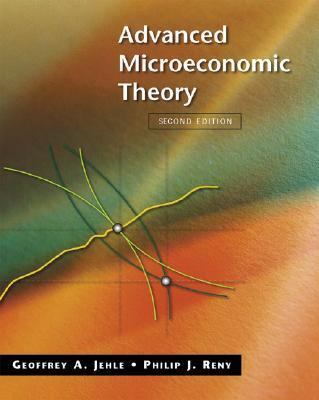 Index.Jehle, Geoffrey Alexander is the author of 'Advanced Microeconomic Theory', published 2000 under ISBN 9780321079169 and ISBN 0321079167. Loading marketplace prices 11 copies from $12.49 How does the rental process work?